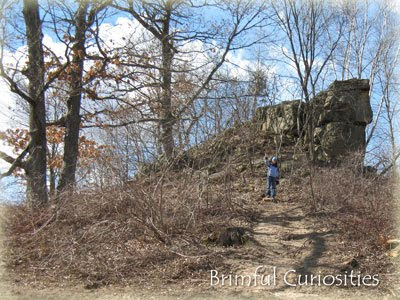 Remember the "A Rock for Climbing" Wordless Wednesday post from January? 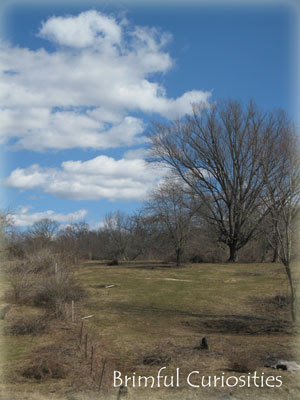 The weather cooperated, and we spent all day Saturday at my grandparents' farm. 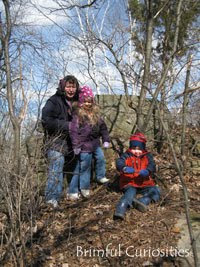 The kids and I climbed up the large rock outcrop with my mom's help. We did not allow them to sit on top of the rock (too dangerous with a tot) but we made it far enough up that they could see the top of the rock. My son showed no fear. My daughter on the otherhand, liked the idea of climbing but did not appreciate the brambles along the path. I couldn't resist taking a picture of the pasture. It's so incredibly picturesque. My son would love to climb that! Looks like a great view. Very nice, clear photos. I especially like the pasture one. Seems so peaceful. Beautiful pictures! That looks like a ton of fun, the boys love to climb anything. That looks like so much fun! My in-laws used to live out in the middle of no where. We would go in the woods and look for arrowheads. I miss that. We do have a good collection of arrowheads hung in shadow boxes in our hallway. Thank for stopping by my blog, Breathe In Breathe Out. I'm tickled to find yours--always glad to find other moms who enjoy children's books and reading to their kids. I looked through your posts and enjoyed them. I didn't know Laura Ingalls Wilder wrote fairy poems. I'll definitely have to check that out. Joining you from the UBP11. You have such a busy blog going on here. It's lovely. It's beautiful up there, but I agree that I'm not a fan of brambles! Gorgeous photos. The sky just makes me want to run right outside for a walk. Beautiful surroundings for a hike and climb. Fun for everyone! That looks like some great hiking to me!